Ndidi is suspended for the Nations Cup qualifier against South Africa after picking up two yellow cards. 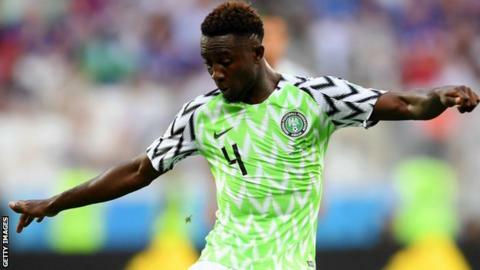 Leicester City's Wilfred Ndidi is confident Nigeria will return to the Africa Cup of Nations in 2019 after missing back-to-back tournaments in 2015 and 2017. Ndidi, 21, who is suspended for next weekend's qualifier against South Africa, is another absentee in a Super Eagles squad dominated by injury withdrawals. "We have a big opportunity to return to the Nations Cup and I believe the players can make it happen," Ndidi, who has 23 caps, told BBC Sport. "The World Cup is gone and we've been winning games after Russia, and it is an extra motivation to prove that we learned from the mistake of missing the last two tournaments in Africa. "It is my dream to play in Cameroon next year, my teammates share the same ambition and we have a big chance to make it happen now," he said. Champions in 2013, Nigeria lost their opening qualifier at home to South Africa last year - but they bounced back with victory over Seychelles and two wins over Libya to keep them on course to qualify for the 2019 finals in Cameroon. "We've suffered some setbacks but that is all part of the game, but I don't think that is enough to stop us," Ndidi added. "Injury and suspension should not prevent us, it's been tough because other players at the club will tease you if you don't play in big tournaments. "For our careers, our country and fans we should be playing in the Nations Cup and we have to make it happen now." Nigeria are top of Group E with nine points from four matches - a point ahead of second-placed South Africa - and the three-time African champions will seal qualification to next year's tournament if they beat Bafana Bafana on 17 November.